Last night on his show, he tackled The Onion’s hard-hitting allegations—that is, that he is an alien-like parasite that festers by the dozen within the decaying corpses of disgraced neoconservative sexual predators—with the sense of moral indignation that is his calling card. That’s right, you sick liberal fucks—his daughter is out here reading The Onion, being exposed to their, um, Kathy Griffin-esque brand of violent social satire. 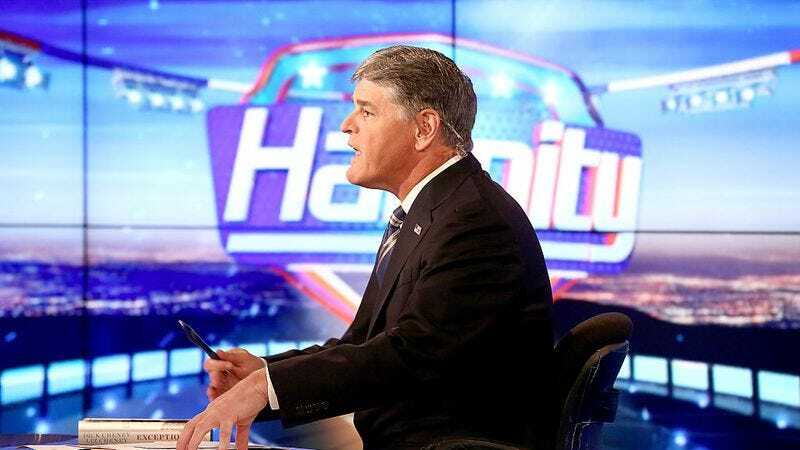 Whether this goes on to be a crusade for Hannity remains to be seen, but we can all rest easy knowing he has read and internalized the phrase “two-inch-tall, mucus-covered Hannitys,” an image that will surely haunt him more than the fact that advertisers are fleeing his show and that the network built on misinformation, disdain for its viewers, and good old-fashioned American racism is crumbling around him.